I absolutely love teaching moon phases and after 14 years, I feel like I've almost perfected the art of teaching this concept. I've created a lot of new things, come up with tips and tricks that will stick with my students, and created some pretty awesome hands-on activities for my students to be able to interact and experience the lunar cycle. And because I only use activities that give me 'a lot of bang for my buck,' I'm able to shorten the amount of time I need to teach the concept and students are mastering the material in less time than ever. I begin on the first day with an engagement activity in which students receive a baggie full of moon phases and they are simply asked to place them in a logical sequence on their table. When they are done with the task, they raise their hand for me to come check it. Over 90% of the time, students will place the pictures in the correct sequence, but they will have the moon pictures laid out in a straight line. So I ask, "What comes after this last picture?" And they usually grab the first picture in the sequence and drag it to the end. Then I ask the exact same question again, followed by another card moving from the beginning of the sequence to the end AGAIN. So I ask, "Is there a better way you could lay these pictures out on your desk?" They very quickly realize that a circle is more appropriate because the moon phases are a never-ending cycle. There is no beginning and no end. After this engagement activity, I begin the "Lunar Lollipop Investigation" in which each student gets to experience and discover for themselves what causes us to see various moon phases from earth and why the moon appears to be lit in the sky. What do you like to do on your days off? Me?... Well I have issues... I took the last 2 days off to stay at home and work on creating more products for my Teachers Pay Teachers store. Lately, my color-by-number activities have been a big hit. I'm starting to add more to the growing list of available topics, so stop by my store and see if there's something you could incorporate into your lessons this week. Students love the change of pace and teachers are thrilled that their students are getting a good review of concepts or additional practice in specific content. And the second best part... all you have to do to grade this (if you choose to), is check to make sure their final picture matches the included answer key. Each numbered area that is colored incorrectly means that the student needs a quick direct teach or review of the concept. 2 -Teacher-Authors at Teachers Pay Teachers are working hard to make teachers’ lives easier! 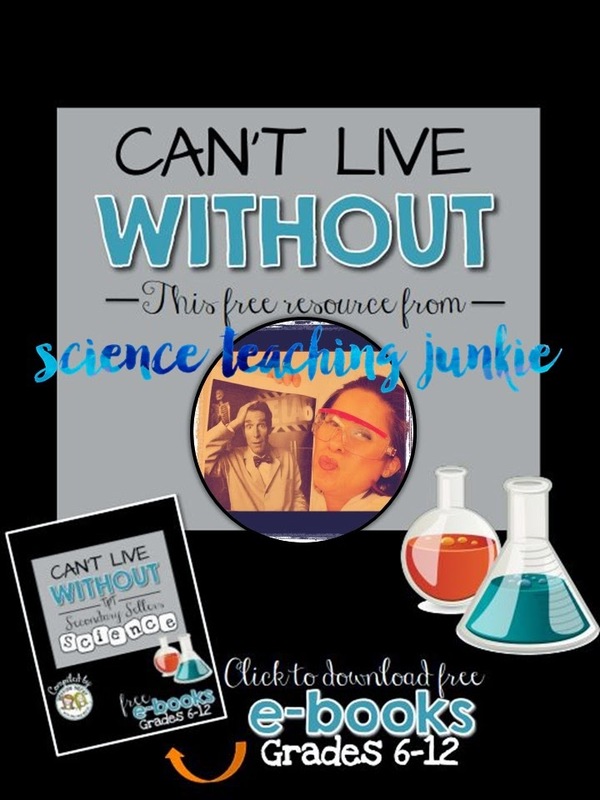 Brain Waves Instruction, Literary Sherri, Getting Nerdy with Mel and Gerdy, and Lindsay Perro have worked to compile 4 FREE ‘Can’t Live Without It’ eBooks filled with 120 instant print-and-teach resources for all you busy teachers out there! And I am so excited to be a part of this special FREEBIE for teachers of all content areas. The eBooks profile middle school and high school teacher-authors and include printable teaching resources from 30 TpT stores in each eBook. The eBooks are categorized for ELA, Math, Science, and Humanities (Social Studies, Art, Foreign Language, and more ELA). In them you’ll learn things that each TpT teacher-author can’t live without and you’ll receive a 1-page resource they think YOU can’t live without! Click on my picture above to be taken directly to me free product in my Teachers Pay Teachers store and don't forget to check out the goodies from all of the contributors.